I love Monty Python and the Holy Grail. Over the years, I've watched it enough to know most of the film by heart. One of my favourite scenes is the one with the French soldier insulting King Arthur and his k-nig-hts in the most random ways imaginable. The title of today's card brought back some of those precious memories. "Your mother was a hamster, and your father smelt of elderberries." After The Clown: Bitter Medicine, The Clown: On His Throne, and The Clown: Guillotine, we now get a fourth dilemma in the series. Bitter Medicine punishes poorly-balanced mission teams that have multiple personnel who have a skill in common by reducing attributes, then it returns to the dilemma pile. Sometimes that's enough to stop the mission attempt right away; if not, it's a good way of setting up a wall dilemma that requires a certain attribute total (e.g. Gomtuu Shock Wave, Fesarius Bluff, Excalbian Drama, or Rogue Borg Ambush). Guillotine also targets a specific skill, and kills at least one personnel who has that skill. It's a great scalpel to remove key skills from a mission attempt, especially when there is an All-Consuming Evil or two among the three dilemmas consumed. Like Bitter Medicine, Guillotine comes out, laughs at you, then it goes back to the dilemma pile to insult you again later in the game. "Go and boil your bottoms, you sons of silly persons!" The most recent installment of the "Clown" dilemma series is called The Clown: Go Away, and it differs from its siblings in that it does not interact with a named skill. Instead, it is placed on the mission and does nothing to the current attempt, so you have to come up with some other means of stopping the mission team. However, once you've successfully stopped the mission attempt, Go Away will sit on the mission like the French soldiers in their castle and throw random taunts (return a random personnel to hand) at subsequent mission attempts. Only by running away for a turn (not commanding any personnel or ships at that mission at the start of your turn) can you make the taunters go away themselves (the dilemma is removed from the game). Building a large wooden rabbit for your next attempt is optional, and no guarantee for a successful storm at the castle. So once Go Away is on a mission, as the attempting player you get the choice of either turning your back on that mission for a turn (fly home to pick up reinforcements, or move to another mission and attempt that instead), or attempting the mission again right away. Be careful, though, as the random personnel returned by Go Away might be enough to stop your mission attempt unless you have complete skill redundancy. Should your opponent have managed to place a Bre'Nan Ritual as well on the mission, chances are good that he won't have to play any dilemmas at all in order to stop you. "You don't frighten us with your silly knees-bent running around advancing behavior!" Retreating to your headquarters for reinforcements if you don't actually have to feels like wasting a turn, so often times you will probably want to attempt another mission instead and get some dilemmas under. Just hope you don't run into Arena or Left Behind, two dilemmas that your opponent can use to send your personnel to a planet mission that has a Go Away on it. However, sometimes you might be able to use a Go Away on one of your own missions to your advangtage. 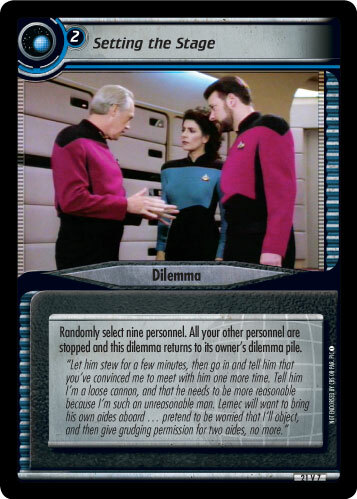 Depending on the number of dilemmas overcome, you might be able to send small away teams consisting of only one or two personnel to try and bounce (return to hand) cards that have useful "when you play" triggers like Alexander Rozhenko (K'mtar), Gelnon (Aloof Tactician), Evek (Agent of Cardassian Justice) or P'tol. But if you run these kind of cards, don't count on your opponent giving you the new Clown to face.